In a medium saucepan, heat the olive oil on medium-high heat. Add the couscous and cook, stirring occasionally until slightly browned and aromatic, about 3 to 5 minutes. Add the chicken broth and bring to a boil. Simmer for 10 to12 minutes or until the liquid has evaporated. Transfer the cooked couscous to a large bowl and set aside to cool. Add the parsley, rosemary, thyme, apple, dried cranberries, and walnuts. In a small bowl, combine the vinegar, salt, and pepper. Whisk in the olive oil until smooth. 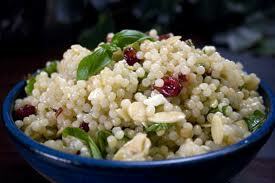 Pour the vinaigrette over the couscous and toss to coat evenly.